Queen St. Warehouse has opened on Queen West , less than six months after its crazily popular first Toronto outpost, El Furniture Warehouse , arrived in the Annex . Occupying what was formerly Everest at Queen and John, the Warehouse group's eleventh location (the other nine can be found in B.C. and Quebec) still very much follows its predecessors' recipe for success: all items on the food menu are priced at $4.95. 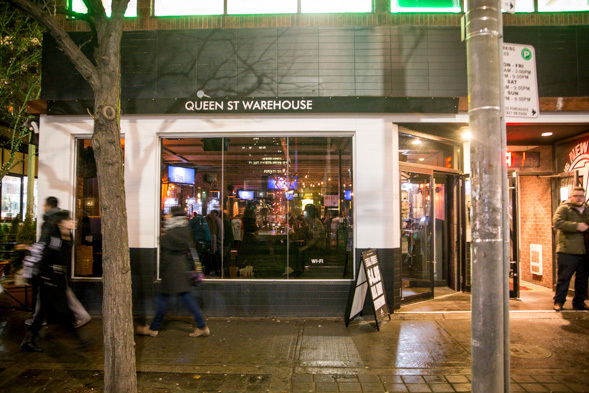 While El Furniture has a ski lodge theme, this new 125-seat Queen St. locale is more music-inclined, since the Bell Media building is across the street and institutions like The Rivoli , The Rex and The Horseshoe are nearby. TV screens show music and concert vids as well as rap battles, and accompanying tunes are a mix of '80s and '90s rock, R'n'B and hip hop (the bartenders are singing and dancing along to TLC's "Waterfalls" while we're there). Skratch Bastid is one of the backers here. The two main Toronto partners, Sean Young and Ian Ross, are stoked about the 70-seat side patio outside for when warmer weather hits the city - it offers a sweet view of the CN Tower. Both men lived on both coasts of the country before moving here; they first met and got involved with the Warehouse biz when they were living out west (Ross starred in a MTV Canada reality show called Peak Season set in Whistler), while also discovering they went to the same high school in Halifax. 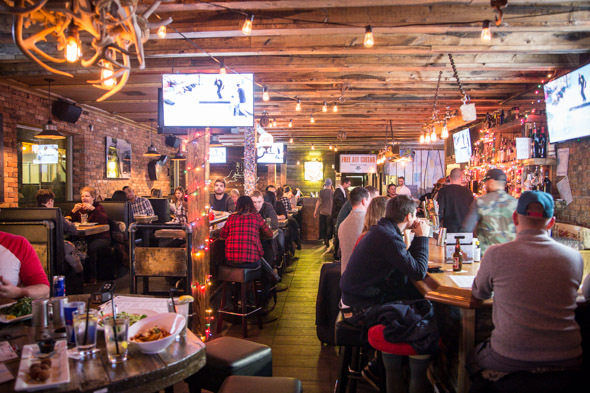 Like the other locations, this "premium dive bar," which Young and Ross inform me is a term coined by blogTO's very own Liora Ipsum (Liora, you should get free food and drink for life! ), has a strong party vibe. 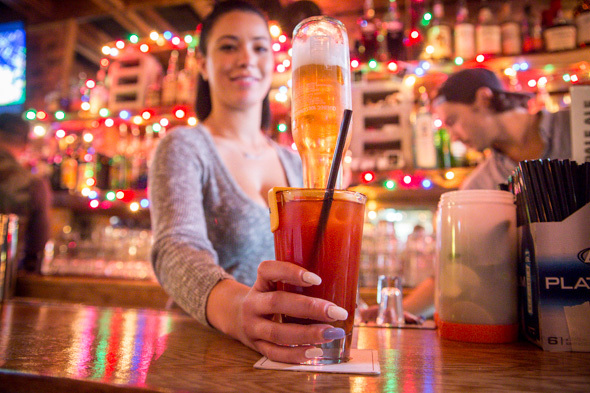 Take, for example, their Red Eye Corona ($11.50), which features an upside-down bottle of Mexican cerveza presented inside in a spicy Caesar, so you can watch the beer level drop as you sip the drink. Most shooters, like the food, go for $4.95. 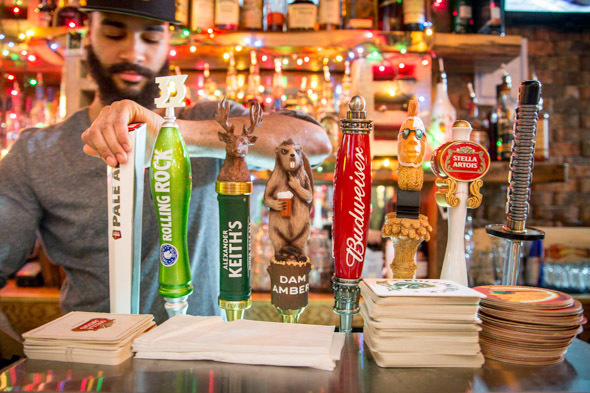 Eight draft beers range from Budweiser ($5.75) to Shocktop or Stella ($6.75 each). Bottles start at $6.50 for a Sleemans and top out at $14.25 for a Delirium Tremens. New premium offerings have been added (like the Delirium Tremens) by request of patrons at the Annex spot. Although you can now drink Veuve Cliquot or Dom Perignon here, there is definitely no bottle service - in fact, it's served in rocks glasses. "No flute glasses allowed," Young says. Executive chef Matt Deacon-Evans is responsible for the menus at all 11 locations, and for a place where every food item is $4.95, it's a pleasant surprise that the quality is actually decent and the portion sizes fair. 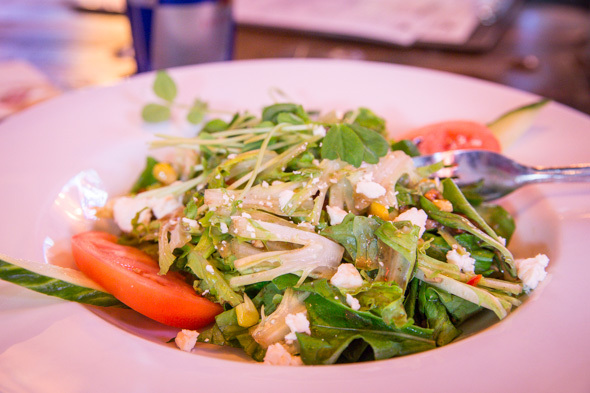 On the lighter side of things, there are "twisted greens," a salad of organic greens, feta, corn salsa, candied pecans, cucumber, tomato, pea shoots and balsamic vinaigrette. 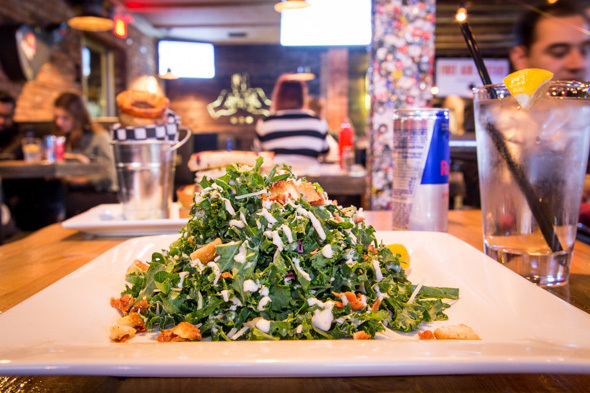 More up my alley in terms of salad is the kale caesar, containing kale leaves, creamy caesar dressing, croutons, maple bacon bits, parmesan cheese and a lemon wedge. Marinated chicken or braised beef can be added to any salad for an extra $2.25 each. 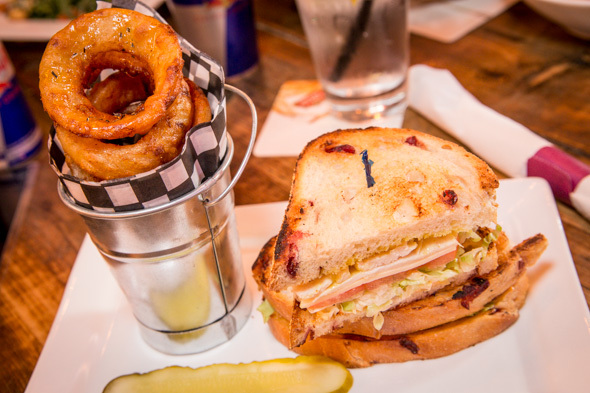 More substantial items include a roast turkey sandwich, with house-roasted turkey breast, a house "macho" sauce, swiss cheese, honey mustard, lettuce and tomato on cranberry sourdough. A daily soup, peppered fries or local wild greens come as a complimentary side, but for an extra $1.95, you can substitute yam fries, the kale caesar salad or maple and rosemary glazed onion rings (definitely recommended - they're huge) instead. 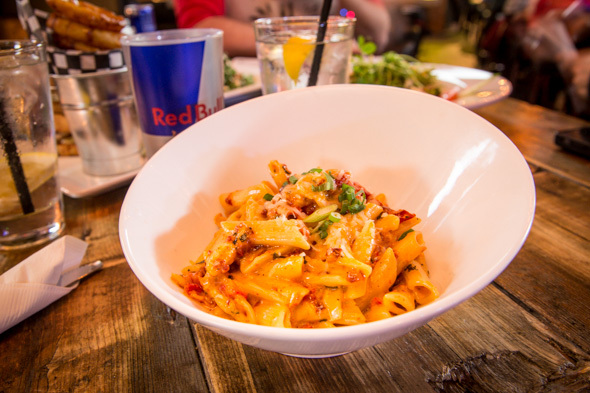 A sundried tomato pesto penne with parmesan and fresh herbs is tasty and of good value, especially since you'd be paying double the price for a dish like this elsewhere. Crisp maple bacon can be added for $1.95; marinated chicken or fresh herb pan bread for $2.25 each. 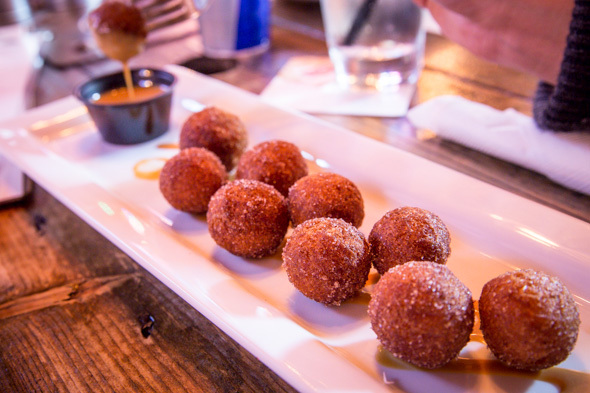 Dessert-wise, the mini donuts, which are actually donut holes (or Timbits), are a real winner. They're dusted in cinnamon sugar accompanied by a caramel-coffee dipping sauce, and they're dangerously addictive, so make sure there's someone to share them with or you'll eat them all. The Toronto Warehouses were the first of the bunch to introduce the option to buy a meal for the less fortunate; servers will never solicit you to do so outright, but the bottom of the food menu suggests it (you can also choose to buy a beer for the chef). Every Sunday, Young and Ross take meals to the Evangel Hall Mission on Adelaide West, and they say the number they bring increases each week. 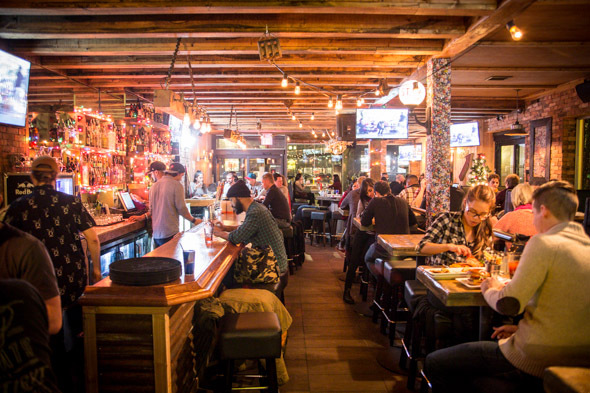 With a great location and the same irresistible cheap-eats-good-times formula as its sister spot in the Annex, this place can't really lose. Expect lineups.